EC Homelife Tension Shower Curtain Rod 46-74 inches Never Collapse,No Drilling, NEVERRUST by EC Homelife at Walk In Tub Showers. Hurry! Limited time offer. Offer valid only while supplies last. Are you still searching for a solid rod that will hold your heavy shower curtain from falling on your head? Take our rod! Non-slip ! Never Rust ! Are you still searching for a solid rod that will hold your heavy shower curtain from falling on your head? Non-slip ! Never Rust ! Works on All Surface ! Modern decorative rod for bathroom,kitchen,window,wardrobe,closet,etc. The telescopic net curtain rail is full spring structure, which is supported by the friction between the rod and the wall. Please do not turn the extendable rod after the installation. Super Sturdy & Durable --- The stainless steel tension rod can bear 20lbs. The rubber ends help grip the walls and the internal flange helps to hold the rod at the desired length. 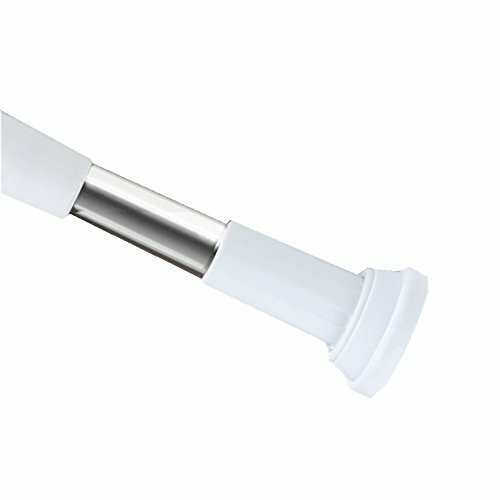 Non-slip on All Surface --- Our spring tension rod adopts innovation technology, holds firmly like screw, can be applied to wood surface, wall with wallpaper, tile wall, smooth or rough wall, all good! Quick & Easy Setup --- No drilling, no tools needed, no harm to your walll. Remove easily and cleanly. Just rotate the tube and adjust to the length you need, turn the rod to tighten it once you have it in your desired spot. Never Rust & Smooth Like Mirrors --- Super thick 304 stainless steel and anti corrosion shower rod, easy cleaning. The rubber ends will not scratch or damage the installation surface. If you have any questions about this product by EC Homelife, contact us by completing and submitting the form below. If you are looking for a specif part number, please include it with your message.